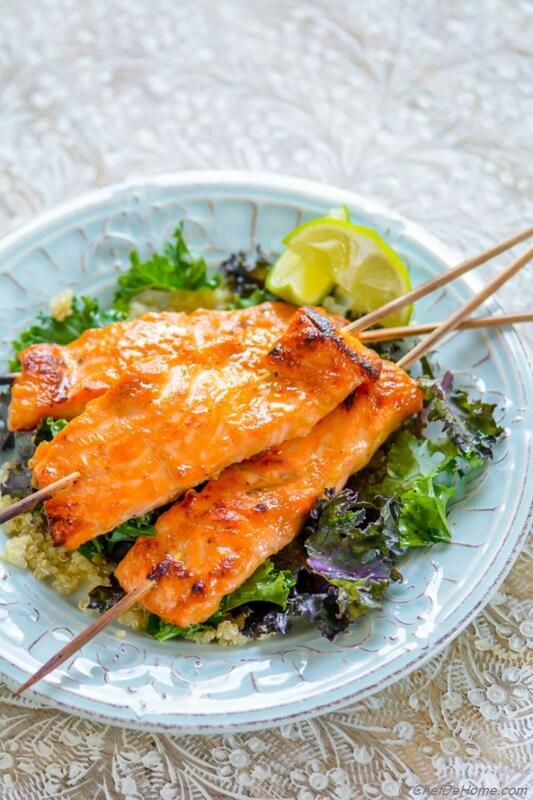 A healthy gut-friendly miso-ginger marinated Salmon served with side of lemony Sesame Kale salad and quinoa. 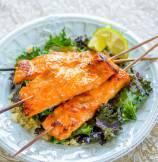 Dust-off the grill or switch-on broiler for few minutes..... and let's welcome spring with a lite, low-calorie Salmon Dinner. Sounds good? Isn't it? Friends, this salmon dinner comes with promise of a comforting and easy weekday meal! Really, it can't get easier than this! 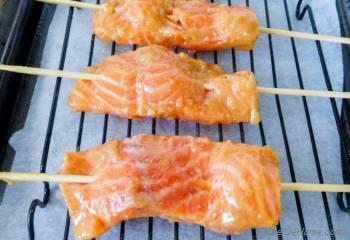 With just 5 minutes cooking time, Miso Salmon fly from kitchen to dinner table! I would say, it is faster than waiting for Order in Asian dinner...... and much budget friendly too. Today, I served Miso Ginger Salmon for dinner with lite kale salad and quinoa. I went lite with today's Kale salad with just a touch of sesame oil and lemon drizzle. It really brings out the flavor of fresh raw kale and compliments the miso salmon. 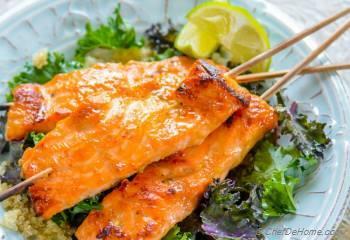 However, instead of Kale Salad and Quinoa, you can also serve Miso-Ginger Salmon with side of rice or a hearty pasta salad to make serving more substantial and more filling. I would rate White Miso Salmon mild with subtle flavor of white miso and ginger.... yet with very distinct Asian umami soy taste. Cooking the marinated salmon under broiler tones down the strong flavor leaving behind a flavorful char and flavor-infused flaky salmon. 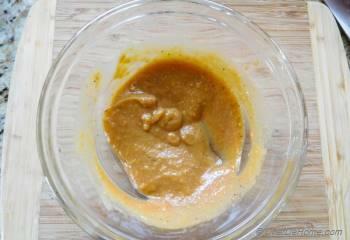 Fermented soy beans and rice paste, miso is a Japanese seasoning. You can spot Miso in Asian aisle of most stores. If you love Asian flavors, I recommend trying it. It tastes good and since it is made with fermented soy beans... it is also good for the gut. Without doubt, I mostly use miso in cooking for it's gut-friendly fermented beans which are good for health. I must say, when I first had miso, I really liked the fermented soy taste. Miso has various varieties. I have only come across white and red. White Miso is milder than red miso. Miso is very potent and salty, so a little goes a long way. If you just starting using it, use less. Other than marinades, I like to add some in salad dressings and also in miso soup. I'm sure you agree, restaurant's Salmon Menu can be little expensive. Actually, not little, a lot expensive! Cooking Salmon at home is easy, far less expensive and healthier than meats. Plus, if you are ever intimidated by cooking salmon perfectly? 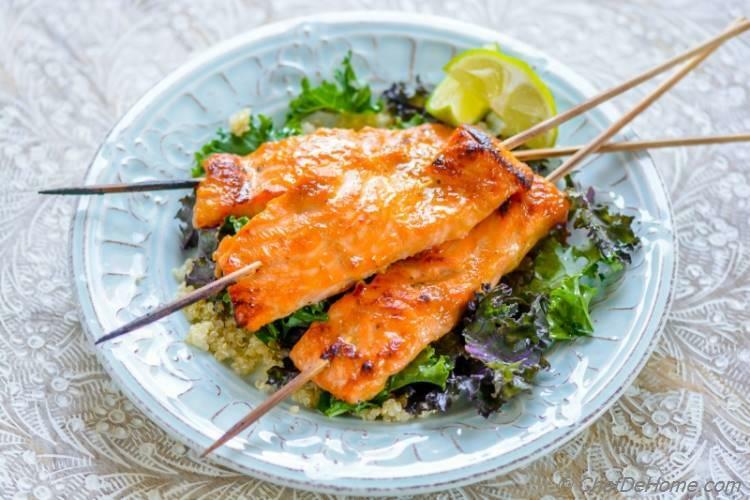 This 4 minute broiler method will make you home-cooked-salmon-lover, for sure! What I like best about cooking seafood/fish at home? 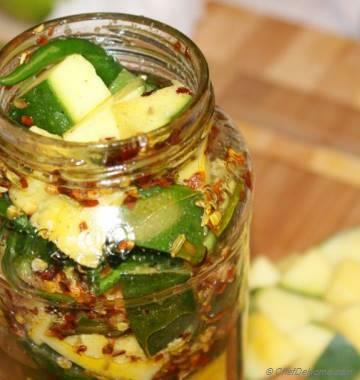 Other than healthy Omega-3s (of-course), that it needs very less marination time. Like this Miso-Ginger Salmon, I just coat in miso paste and set aside for 5 minutes before I thread it in skewers and broil. 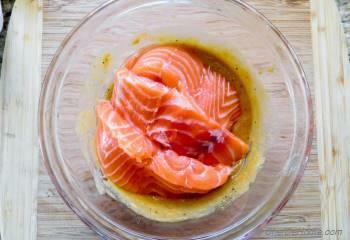 You can leave salmon in marinate longer. Never more than 1-2 hours. The delicate flesh of fish or seafood can start cooking in acidic marinates very quickly..... So, a fish marinade should have least acid, just flavor enhancing ingredients. PS: For this recipe, I sliced salmon vertically in half (you can ask butcher to slice and clean salmon), which reduces the cooking time and also cooks salmon in broiler quickly.. without need to turn halfway. If you broiling or grilling thicker steaks of salmon, please adjust the cooking time. I suggest turning the skewers halfway through cooking to cook both sides properly. Diet Info: This Miso Salmon is Gluten Free and also dairy free. Just make sure to check the label on White Miso Paste for gluten. For soy sauce, always use Tamari which is naturally gluten free. 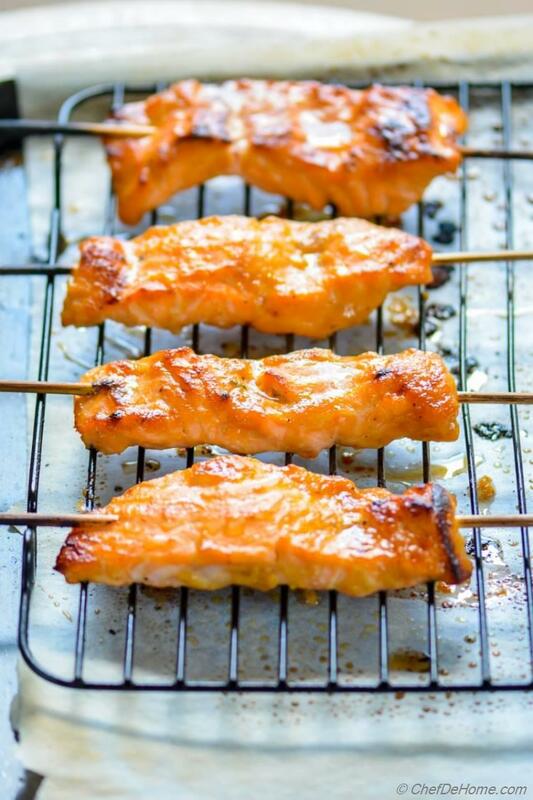 Spring is here :) How about grilling some Miso-Salmon for dinner tonight? Wish you great start of Monday and Happy Spring! Love Salmon? Add some healthy omega-3s to your diet with following Salmon recipes! 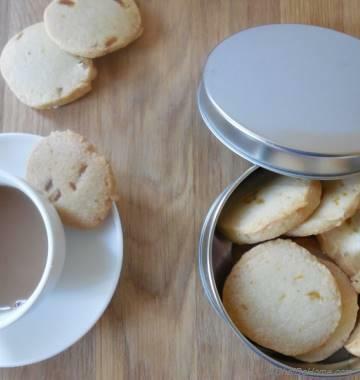 Total Time 15 minutes Prep Time 10 minutes Cook Time 5 minutes Difficulty Easy Yields 2 Servings Serves 2 Notes No. of servings depends on serving size. Smart Swap Just add a splash of lemon! This Salmon Recipe is already pretty smart and fit. 1. Kale Salad: Tear kale into small pieces, remove ribs and add to a salad bowl. Dress with lemon juice, sesame oil, salt and black pepper. Toss well and set aside. 2. Preheat oven at 450 degrees Fahrenheit. In medium bowl, add all Miso Ginger Glaze ingredients. Mix with a spoon to make paste and set aside. 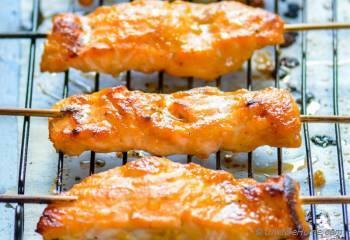 If using wooden skewers, soak in water for 10-15 minutes to avoid burning under broiler. 4. Thread each piece into wooden (or metal) skewers, place on greased sheet. I like to place a wire rack on sheet for more even heat distribution. 5. 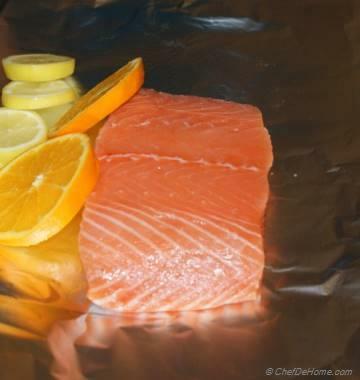 Turn on broiler, broil salmon under broiler for 4-5 minutes or max 6 minutes or until edges are start to turn golden brown. Remove from oven and let cool on wire rack for few minutes. 6. 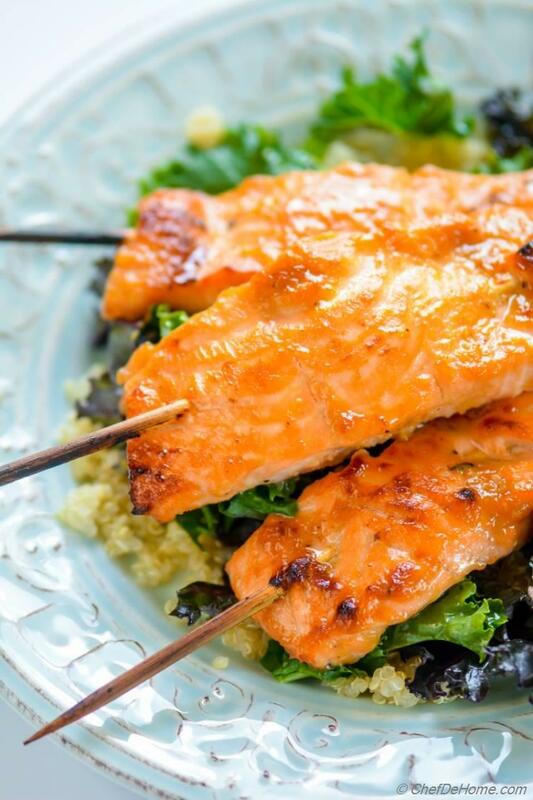 Serve family-style with salmon skewers, kale salad and quinoa on the side. Enjoy! Very tasty. Cook stove top. This was super easy to make and delicious! Can't wait to eat the leftovers for tomorrow's lunch! Hi Vanessa, I'm glad you enjoyed Miso Salmon! Leftover sure make great lite lunch. Thanks for taking time to share your experience. GAH!!! THESE LOOK BOMB! I'd eat 6 skewers without even blinking an eye! :) How sweet! thanks, Gigi! :) Glad you like it, my friend! This dish looks incredible! I love that the fish is paired with lemony kale salad! YUM! thanks, Bethany! I agree, the lemony kale was great compliment to Salmon.